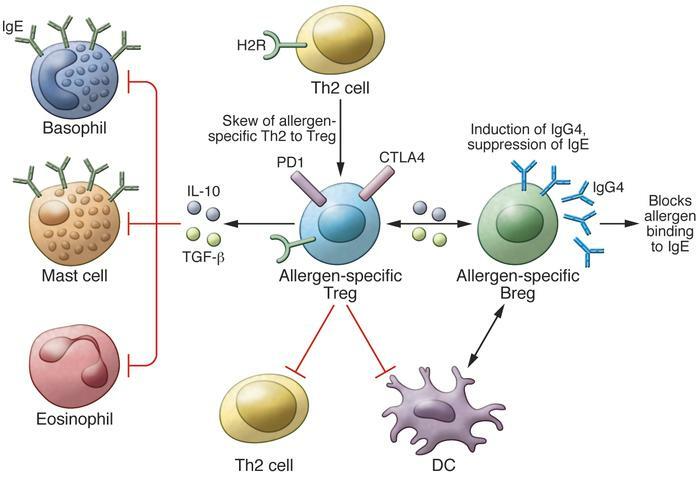 The induction of allergen-specific Tregs, which switch from allergen-specific Th2 cells is one of the initial events in the development of allergen tolerance. The effector cells of allergic inflammation — mast cells, basophils, and eosinophils — are regulated by suppressive and regulatory functions of Tregs in several ways. Treg-secreted IL-10 and TGF-β suppress these cells. Tregs also suppress Th2 cells and their cytokines, preventing the provision of survival factors for these allergy effector cells. IL-10 and TGF-β suppress IgE production by B cells, and meanwhile, IL-10 induces IgG4. IL-10–producing regulatory B cells (Bregs) play a role in suppression of allergen-specific T cells and mainly switch to IgG4-producing plasma cells. H2R plays a role in the suppression of Th2 cells, inflammatory dendritic cells, and basophils.